BOSTON, Massachusetts, Nov 27 2012 (IPS) - Efforts to promote the use of hydraulic fracturing, a controversial method of obtaining oil and natural gas, face stiff opposition from researchers and citizens who say that in its present form, the technology’s risks far outweigh its worth. Proponents argue that hydraulic fracturing, or fracking, as it is known, could make the United States energy independent, or perhaps even become an exporter. But critics voice serious concerns about water contamination, air and noise pollution, and other hazards associated with the process. Pollutants involved in fracking include known carcinogens and neurotoxins. Accidents are also risks. On Nov. 20, a gas pipeline explosion at a natural gas compressor station run by Bill Barrett Corporation in Nine Mile Canyon in Utah consumed several buildings on site and seriously injured two employees, one of whom remains in critical condition. Leading the fight against fracking-related infrastructure being built in residential communities is the small town of Minisink in Orange County in upstate New York. Since July 2011 they have vigorously opposed a natural gas compressor station being established there. Most of the 200 homes in this rural community, including several organic farms, are within half a mile of the 43-million-dollar project, a gas compressor station owned and operated by Millennium Pipeline, a division of the billion-dollar energy company, NiSource. By approving the project, say residents, the Federal Energy Regulatory Commission (FERC) has failed to follow not only its own guidelines but also federal law. They allege that FERC is hindering their due process rights by refusing to issue a final decision so they can go to federal court. A FERC official told IPS that “the commission does not comment on ongoing cases”. Residents fear that the station, which would compress gas derived from the Marcellus shale region of Pennsylvania, will emit over 100,000 tonnes of pollutants (including known carcinogens) per year into the community. “The project just doesn’t belong in a residential community,” says Leanne Baum, mother of four young children, whose front porch looks across at the proposed site where construction has begun. In response to these concerns, Millennium Pipeline spokesman Steve Sullivan told IPS that the Utah accident occurred in a station running a gathering system very different from the one being set up at Minisink. Accidents at the 1,500 or so compressor stations in the United States are “very rare”. He said that Millennium has “gone to extreme measures to safeguard against accidents” as well as noise and other pollutants. Meanwhile the high demand for cleaner energy in the northeastern part of the United States has led to a visible reduction of emissions. The Minisink plant “has been a boon to the local economy” by employing dozens of locals, Sullivan said. Locals like Baum remain unconvinced, however. On Nov. 15, she and 80 other Minisink activists travelled to Washington DC to protest outside the FERC office – their sixth such trip. “There is no one protecting the public,” Pramilla Malick, a Minisink resident and one of the organisers of the town’s opposition to the project, told IPS. “Our environmental laws may as well not exist because, right now, no one is enforcing them,” she said. “Foreign companies are rushing in to buy drilling leases and the regulatory agencies are handing out permits like candy,” at Americans’ expense. In Minisink, the citizens who suffer the costs include 9/11 first responder Nick Russo, who lives down the road from the upcoming gas project. Already suffering from respiratory problems since 9/11, the retired New York Police Department (NYPD) sergeant is “worried sick” about what the project will do to his health. Many other retired NYPD and Fire Department of New York (FDNY) officers, including first responders on 9/11, live in Minisink. John Feal of the Fealgood Foundation, a 9/11 advocacy group, has written to the FERC asking it to reverse the order allowing the project. As the pushback gathers momentum, the gas industry is finding new ways to get its message across. A report on Truthout.org exposed how search engines like Google were placing “pro-fracking propaganda” and advertisements at the top of search results to discredit research that exposes the risks posed by fracking. The Truthout report said that the top result of a search for Robert Howarth, a Cornell University ecology professor whose research concludes that fracking has an even greater carbon footprint than coal, yielded an ad against him by America’s Natural Gas Alliance (ANGA). Since then, the ad placement has been removed..
New York has a moratorium on fracking, which Governor Andrew Cuomo has considered lifting, although he backed off under pressure from anti-fracking activists. Meanwhile, companies in Pennsylvania are aggressively extracting “fracked” gas that the United States hopes to export. New York-based Angela Monti Fox, founder of The Mothers Project, which supports a sustainable energy future, warns of a large-scale, peaceful civil disobedience movement if the gas industry continues to ride roughshod over communities like Minisink. If companies continue to build infrastructure in residential areas, “it builds a groundswell of individuals and communities that will ultimately rise up against them”, she told IPS in an email. Minisink’s spirited campaign includes residents filing over 800 objections against the project with FERC. 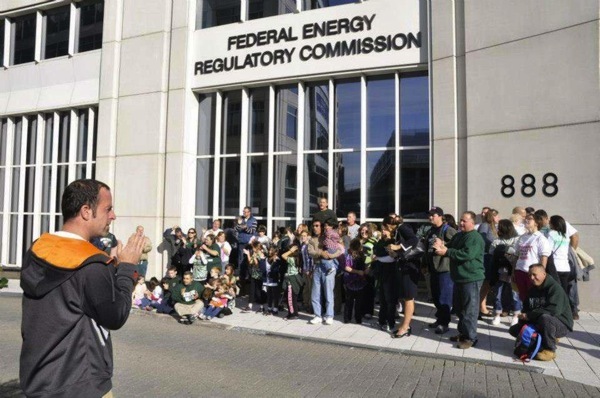 Attending the FERC meeting earlier this month, they occupied the entire FERC chamber, forcing industry insiders to stand in the back. Thanks. I didn’t see it crop up when I googled Howarth. particular could be used for terrorist attacks. territory of the US by Title 49 of the Code of Federal Regulations. found at 29 CFR 1910.120.
disposal of waste hazardous materials. contents and everyone working on it adequate protection. confidentiality agreement because this contravenes due process of the law. Fracking companies and bent politicians. put their personnel gain before human lives. US Law and gag you whilst they do it.